Trevor’s interest in photography was sparked at a young age and by the time he was in his teens he was taking and developing his own photos. He cut his teeth as a photographer in the early nineties capturing the political changes taking place in South Africa. Later, moving away from journalism, he travelled extensively with his camera always at his side. He’s traversed from coast to coast in both America and Australia, photographed the glaciers in Iceland and spent time under the mentorship of a renowned photographer in Thailand. 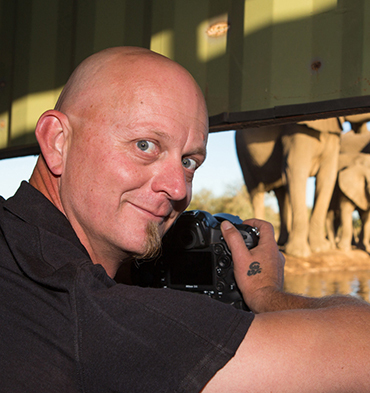 These days he and Janet are now C4's in house photographers/hide managers at our Photo Hides in Mashatu, Botswana. Although he’s happy shooting landscape, big 5 or even the tiny critters, his favourite subject by far is birds. All forms of wildlife from Big 5 to Macro but especially Birds.